Danger – Quicksand – have a nice day! UPDATE: The original sign, on Route 29 north of Charlottesville, VA appealed to my non-PC nature because of its combination of warning and greeting. Something about it seemed like an apt catch phrase for our rapidly changing times. Although it is many yards off the highway, it caught my eye while driving at high speed in heavy traffic. I turned around, made a big loop, and drove onto the shoulder in order to capture the photo. In fact, I wished there had been signs like this in front of some of the companies where my friends and I worked. We might still have worked there, but this warning would have spared us years of wondering why we were not making progress and people kept disappearing. When I wrote a guide to surviving corporate employment, this sign was incorporated into the cover design. 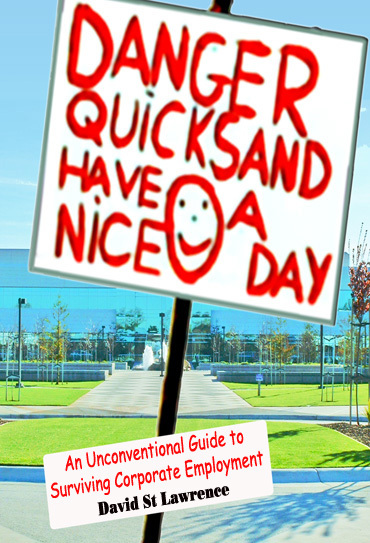 0 Responses to Danger – Quicksand – have a nice day!